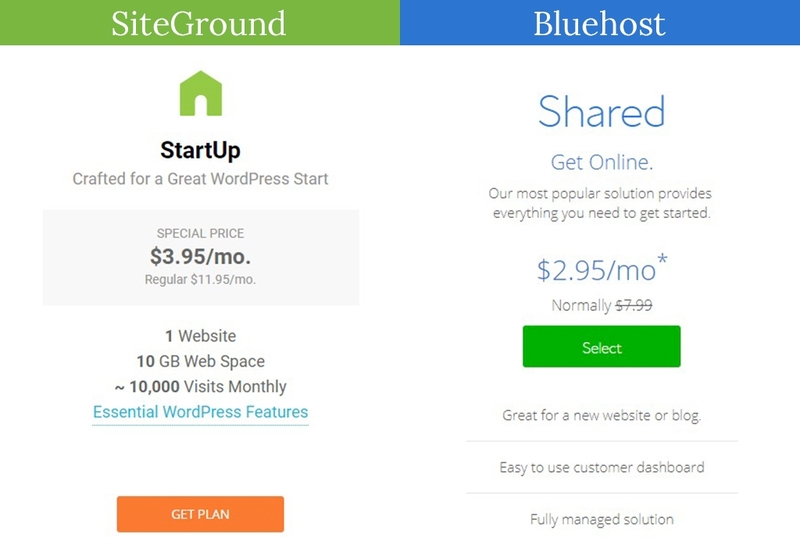 SiteGround vs Bluehost: Which is the Best Hosting Service for WordPress? How to choose the right Hosting Platform for your Website? Web hosting market is not the tiny one. Literally, there are hundreds of options available. So, these are the few things you need to be careful while choosing the right hosting platform for your website. While there are multiple hosting services available, don’t just count pennies and go with the cheap or don’t have the misconception about getting awesome service with a heavy price tag. Do a little bit of research and just buy what you really required. Below list will help you choose right hosting platform for your website. First of all, you have to figure out what kind of website you are going to create. Is it small, medium or a large project? Every website will have its own needs. Therefore, you need to assess your needs, such as: Is your company well established, growing, or just a small blog? Knowing your current and future needs are vital in order to make the right decision in choosing a web host provider. Make a list of your requirements and consider your future needs as well. Make sure that any provider you choose meets or exceeds your needs. Don’t forget about additional domains, support, backups, and more. Make sure your provider can grow with you. It’s best to stick with a more established company that can deal with growth without compromising. While researching in-depth about web hosting companies, what we found is they all have similar claims, such as unlimited disk space, unlimited bandwidth, and email. Personally, we recommend you to check the accessibility of various channels for 24/7 technical support. However, try yourself and make a test call. You will probably be connected with the Sales department, but you’ll definitely see what kind of support you are getting. Long response time, lots of redirections – is not a good sign. Make sure that your web hosting provider has made customer support a priority. Read the real reviews because a hosting company can advertise itself as the one, but customer’s reviews will speak for themselves. This will give you insight into what their current and former customer really feel about the company. However, even if there are bad reviews (and you will find those for sure), check whether they are replied to. Reliable hosting companies check review websites and reply to negative ones, offering solutions like advising customers to contact techs, etc. What we would like to add up next is price. Does it fit your budget? Don’t get tempted by the cheap price offers. So before clicking “Buy Now” under the “$0.99 per month” plan, make sure to take a closer look at all the features that come with this hosting. And also do read terms and conditions and check what it is going to be AFTER the first year before you make your purchase. Check the hosting plan description, take a look around and find out what are the other additional features available for free. Some hosting companies also offer dedicated IPs, SSL certificates, additional backups, etc. Find out what bonuses you are getting with this hosting. According to Forbes daily 30,000 websites get hacked on daily basis. You surely don’t want your website to be in this list and lose all of your time, effort and work. Make sure your hosting service protect your websites from those malicious attack and have daily backups. Another major thing to consider is whether your hosting providers offer SSL certificate or not. The purpose of SSL certificate is to encrypt your sensitive information from your websites like username, passwords, and credit card numbers. When an SSL certificate is used, the information becomes unreadable to everyone except for the server you are sending the information to. This protects it from hackers and identity thieves. We have created this post without being biased; putting together the most popular WordPress hosting company comparison as fair as we can. While creating this article we have undergone in-depth thorough research. No doubts, both of the hosting service providers are brilliant in their own respects but the vital question for us now is ‘which is the best WordPress hosting platform?’ The battle between the two competitors is really tough. So, today we will be comparing SiteGround and Bluehost from 5 different essential motivator in decision making when it comes to choosing right hosting platform for your website. Both the platforms have their own supporters claiming it’s the best. So, we decided to give you a piece of correct information on this platform to help you select the best out of best. Note:This article does not recommend any hosting companies. Instead, the goal is to show users how the two hosting platform differ in terms of functions and features they offer. SiteGround vs Bluehost, #SiteGround #Bluehost #Which is the best Hosting Platform for WordPress? Click To Tweet You can click on any point to directly see that section. Looking for the answers but short on time? If you just want a brief comparison, take a look at this table where we have made a comparison of both hosting provider functionalities. 24/7 Live Chat, Phone Average Loading Time 2.29 Seconds $2.95/mo. 24/7 Instant Tickets, Live Chat, Phone Average Loading Time 1.26 Seconds $3.95/mo. From the above table, it’s clear that major differences between SiteGround and Bluehost are pricing, support and Speed. Now that you have the basic idea of what these two hosting company offers, let’s get into the detailed and informative comparison of them. First of all, we have support, which in our opinion is the most important thing when choosing a web hosting provider. Especially if you are not all that technically inclined because sooner or later something can go wrong and you don’t want to wait on the phone for a very long time. Or send in a support ticket and not receive a response back for days at a time. You want to be able to reach a support representative as quickly as possible so they can resolve the issue as quick as possible and get your website back up again. SiteGround offers 24/7 support tickets, live chat, and phone support. And the support ticket response is less than 10 minutes which is fastest in the industry. Their live chat support and phone support is instantaneous. They always have someone available to answer a chat or to pick up the phone whenever someone needs assistance. 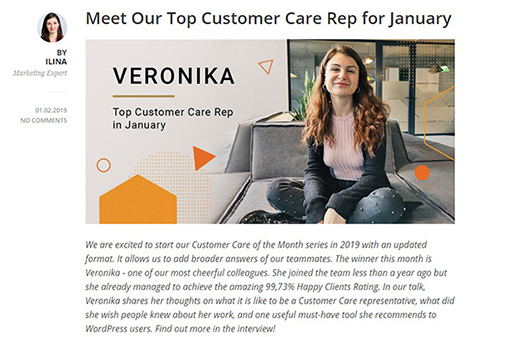 They have also highlighted some of their best-performing support reps every month on their blog page. We don’t see any other web hosting companies do that. To us, it shows that they are putting a lot of focus on having support available and making sure that the customers are satisfied. And giving their support reps an incentive to do so by highlighting them on their blog every month. Click on the image above for the full post. Bluehost, on the other hand, offers 24/7 technical support through phone, chat, and email. And they also have an extensive knowledge base where you can put the problem that you’re having into a search box and it will return some results that will give you some troubleshooting steps which might resolve issues. One of the downsides is that they don’t have a support ticket system, and we kind of questioned why this is a case? They are a big company, they have a lot of resources, so why don’t they have a ticket system? It would be nice to have just another way for someone to be able to interact with your support team. In the Nutshell, Lack of support tickets in Bluehost and Instant response within 10 minutes in SiteGround clearly puts SiteGround in the spotlight when it comes to the Support they offer to their users. Next up is speed and uptime, and what we’re looking here is something that tells us in which server our website is going to be hosted. And what kind of software and hardware are designed to make our website load faster. So that we can take full advantage of those features. SiteGround clearly displays how they utilize a combination of hardware and software to make the fastest hosting using the best in speed technology. They have: SSD drives, NGINX servers, caching plugin that you can use for WordPress, a free one-click content delivery network through Cloudflare, HTTP/2, and PHP 7. Now, when we look at Bluehost they don’t share much about their speed and uptime. We couldn’t find anything that talks about how these servers were equipped for being fast. We didn’t see any mention of SSD, drives or PHP 7, or any type of caching ability like that. In case of similarities, they both offer a 99.99% uptime, and although we couldn’t explicitly find this written in Bluehost website, 99.99% is the industry standard so we are going to assume that they can at least hit that. In the Nutshell, both SiteGround and Bluehost meets industry standard when it comes to uptime.Having said that, SiteGround has latest and more speed technology, you can always rely on them to make your website faster. But sometimes depending on varieties of issues you may experience downtime no matter whichever company you choose. So next up is the features and security, we are going to first talk about what both include and then we will go over what each one offers that the other doesn’t. They both offer 30-days money back guarantee so in case if you change your mind within that 30 days then you can cancel your account and get a full refund. 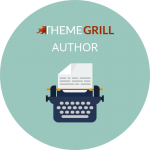 All the plans that they offer are also optimized for WordPress along with free automatic updates. And they also offer free SSL certificate for a secure web connection. And they both offer 24/7 support and customer service as we mentioned above. SiteGround does not offer free domain name. You get a free domain name for a year. HTTP/2 is enabled on all SiteGround servers. 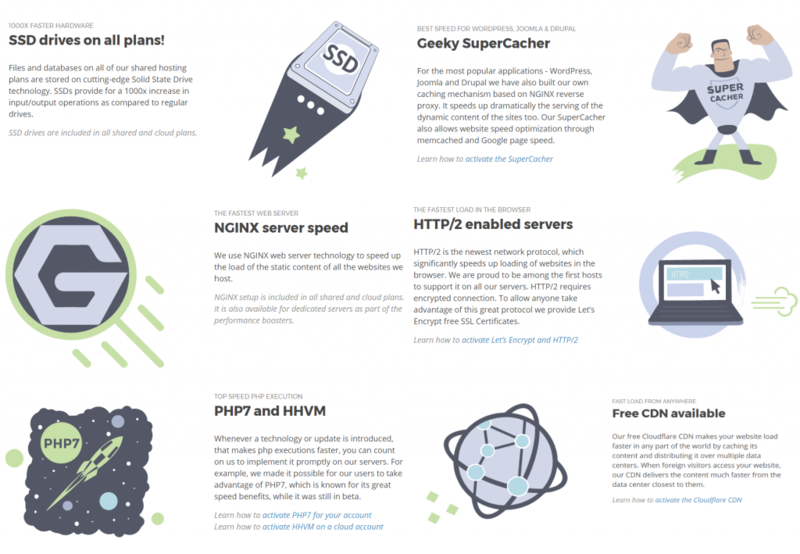 HTTP/2 enabled on WordPress Hosting plan and VPS hosting plan. SiteGround is officially recommended by WordPress. Bluehost is officially recommended by WordPress. Free daily backups on all plans, but free restores only on GrowBig and GoGeek. Backups available via SiteBackUp Pro add-on. SiteGround has IDS / IPS systems which block malicious bots and attackers. Bluehost’s SiteLock addon offers protection from DDoS attacks. SiteGround offers free website migration. Bluehost charge $149.99 for site migration. SiteGround have limited site traffic. Bluehost claims for Unlimited Site Traffic. Now some of the thing Bluehost offers that SiteGround doesn’t is that they give you a free domain name for one year, then after that year is up, you have to pay the going rate for the domain rate registration, which is typically around $10 or $15 per year. They also give you 50 GB of web space. This is five times more than that SiteGround offers but Bluehost doesn’t have SSD drives, which means that the data delivery is going to be slower. So you are getting somewhat a tradeoff there, you get more space but it’s going to be lot slower data delivery compared to the SSD drives that SiteGround gives you. And some of the things that SiteGround offers but Bluehost doesn’t is a one-click migration tool for WordPress. This means that if you are moving from another hosting company and your website is built on WordPress, you can easily move it over to the SiteGround using their migration tool. Some other hosting companies actually charge a fee (including Bluehost which cost $149.99) to do this but SiteGround does this for free. Siteground also give you daily backups, which is very important because if something happens to your website, you want to make sure that you have backup ready so that you don’t lose all of the work, effort and time. And they also have multiple data centers around the world that you can choose to host your website. So if you are in the US and the majority of your visitors are living in the US, then you choose a data center in the USA. But if you are in Asia or if the majority of your visitors are in Asia then you can choose a data center in Asia. And they also have two data centers in Europe as well. And lastly, they also offer a free one-click content delivery network installation through CloudFlare. In the Nutshell: If your site consists of huge numbers of high-quality images and videos then Bluehost gives the best value of money offering 50GB space while SiteGround offers 10GB space. Now, this is where things get real. Because a hosting company can advertise itself as the one, but customer’s reviews will speak for themselves. This will give you insight into what their current and former customer really feel about the company. We went through lots of individual reviews available on the web from Google to other Social Media. Since 2016 SiteGround is setting its benchmark to the top position. Now the peoples who reviewed both SiteGround and Bluehost are real people like you and me who have websites that are hosted on WordPress and have dealt with different hosting companies in the past both good and bad. And yet for the past three years, SiteGround has been number one position. Everyone has different experiences with their respective hosting companies, so we’ll just shortly share our experience with Bluehost (2013 to 2015). Bluehost is one of the most popular web hosting companies, one that many bloggers recommend, and something that’s worked best for us too. We were hosted with Bluehost with a different domain and was perfectly good, only few downtimes (for maintenance, upgrade server both times). We would like to rate 10 out of 10 for support and 9 out of 10 for Server Uptime. Bluehost is a cheap hosting provider and had all the essential safety options when we purchase their service. Another thing coming with the service was a free domain name and 24/7 support. We think the pricing was very fair as we purchased for 2 years upfront. We got a free domain name with it, an affordable price, 24/7 support, and the chance to install WordPress with one click. Their customer service was amazing and they had plans to fit all budgets. As far as our experience with Bluehost, it served us well. We would still recommend Bluehost to new bloggers as it’s cheap and they don’t need a powerful server for a low-traffic blog. We did not posed any problems like the ones encountered by some of the other bloggers. Now another thing to mention is Bluehost is owned by EIG, which acquire over 70+ web hosting companies (Including Bluehost). The reasons people are not happy with EIG owned hosting companies are that they sell more server space than they have which results in slow servers and a bunch of downtimes. And people also claim that EIG outsources their customer support. When customer support is outsourced usually response time is slow and you rarely get a competent response. Although Bluehost has very low hosting prices, they have aggressive upsell and you will need to pay extra for other important features and a vast majority of customers just really aren’t happy about that. In the Nutshell, Customer reviews give you an insight into their services that they are offering. In this part, we would like you to be the judge and leave this part on you itself to go through both hosting companies reviews. Regarding pricing it is kind of difficult to answer- it’s not like asking how much a bag of chips cost. Your hosting price will depend on your provider and the plan you choose; the better plan, the more dollars you’ll need to spend. You need to choose a provider that offers great value for money, but also one which will give you the very best service for your website! If you are on a low budget, you cannot go for a highly expensive platform. Anyways, you must carefully make a wise decision considering the budget you have for your project. If you’re just starting out and all you need is just one website, then you can choose the STARTUP PLAN on SiteGround or BASIC PLAN on Bluehost. So I am going to compare prices between these two hosting service providers. Now SiteGround has an introductory price of $3.95 per month, and after the introductory rate is over the price goes to $11.95 per month. On Bluehost, they offer $2.95 per month as an introductory price, and then it goes up to $7.99 per month, which is four dollars cheaper than SiteGround. But please note that there are couples of caveat on Bluehost. The advertised pricing of $2.95/mo. price only comes with 36 months plan, it would be $5.95 per month for you to do 12 months of hosting at the introductory rate or $4.95 per month for as an introductory rate if you purchased two years upfront. Whereas on SiteGround it doesn’t matter if you purchase 12 months, 24 months or 36 months of hosting, the introductory price is still going to be $3.95 per month. So even though SiteGround is four dollars more expensive per month, you’re really only talking about less than $48 over the course of a year between the two. And most importantly with SiteGround, you are going to get better technology and more features compared to Bluehost. So, this is a case where you get what you pay for. While Bluehost provides a free domain name for one year, in case of SiteGround if you wish to purchase domain then prices start from $9.95. For setting up hosting account with SiteGround they charge a $14.95 setup fee if you pay for their shared hosting plans monthly instead of annually. So, you’d be better off paying 1 year upfront to avoid that. Even though with the lower price tag, compromising the features and services, we think that Bluehost gives us great value for money! In the Nutshell, Besides the difference in introductory rate. Bluehost renewal price is higher than average hosting service providers. And also they have higher upsell process during sign-up. Make sure only purchase add-ons that’s needed. Concluding: Which is the Best Hosting Platform For WordPress? Both web hosting companies featured in this article are awesome, with top tier service and tech, and both hosting companies are officially recommended by WordPress (it’s kind of a big deal, guys!) and that kind of recognition is only given out to web hosts that meet WordPress’s exalted criteria. Judging and concluding, both of these two have a fair share of drawbacks and a fair share of advantages. Rather than one being superior to another platform, SiteGround and Bluehost both can be the best/ most appropriate platform for you depending on your need and resourcefulness. Comparing each one side-by-side, we have concluded that SiteGround gives you more options for support and quicker support. The servers that your website will be hosted on is going to be optimized for speed. They give you more features than Bluehost. The only place where they may fall short is pricing, but in that case, it’s kind of you get what you pay for. So even though if you are paying a little bit more, you are getting more features and better technology. On the other hand, Bluehost have a variation of pricing and plans for the flexibility of users. Bluehost wins the battle of pricing if you are just starting out business while on the other side SiteGround has additional features that come along with the price tag. SiteGround takes the cake with outstanding performance and responsive support. But if you are looking for loads of website storage at lower prices then Bluehost is unbeatable. So the decision is up to you? 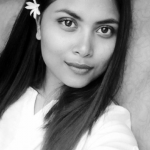 What are you looking for and what are your needs? We have outlined all the pros and cons of both the hosting service providers so that it is easier for you to now make your decision. If you have any experience using these hosting platforms then feel free to share your opinion. ← 5 Awesome Premium & Free WordPress File Upload Plugin For 2019! Hello Raja, Bluehost offers unmetered bandwidth in all of its plans from Shared, VPS or Dedicated hosting. However, I would like to suggest premium plans in Bluehost rather than basic plans for better security and more features if you have a huge website with 5,00,000 visitors per month. Siteground is so much better than bluehost. Their support is amazing and their servers are fast. I have had terrible experience with Bluehost, I would stay away from them!